As one of the five top energy consumers in the state of Mississippiand with energy costs at an all-time high. 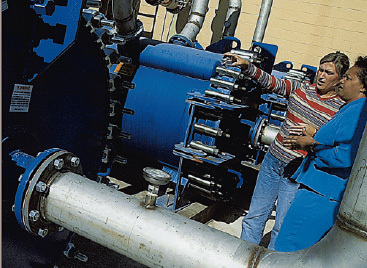 the Mississippi RiverCorporation (MRC) needed to cut energy costs. MRC, a recycle pulp mill which produces pulp for large paper companies, started to investigate ways to minimize energy usage and increase profitability. The spiral heat exchangers are being used to exchange heat between white water and mill water. As hot white water flows through the heat exchangers, it preheats the colder mill water. This mill water will eventually be used as a heating source in other parts of the plant. Therefore, by using the “free” white water as a heating source, MRC is able to reduce the amount (and cost) of steam required to further heat the mill water to a final desired temperature. The all-round heat transfer solution. Compactness and self-cleaning design make Alfa Laval spiral heat exchangers extremely versatile. Ideal for everything from dirty fluids to high vacuum condensation. Temperature cross is possible due to the long thermal length and the fully counter-current flow pattern. The single channel design maximizes fluid velocity and turbulence, which, in turn, minimizes fouling. The hot and cold channel spacing can be varied independently to suit the concentration and size of fibers/particles in the fluid.